Ford, Dodge, Chevy, GMC, Toyota.....F150, 1500, Tundra, 2500…regular, crew or super cab…the variety of truck configurations is vast! Because every make, model and year can result in differences from truck to truck, unique truck undercarriages need to be designed to give you the option to mount a snow plow on your truck. Due to the configuration differences between each truck, the bumper height can vary greatly, and this could cause the cutting edge on your BOSS RT3 V-plow to be misaligned with the ground upon initial install. You can spot this misalignment in one of two ways; you will notice that the wing tips or the center section of the plow will be raised slightly off the ground (see the pictures on the right). If either misalignment is not fixed, it can cause your cutting edge to wear unevenly, resulting in premature replacement of the cutting edge. If you install a V-plow and find the wings tips or center section misaligned with the ground, there are simple 4 steps to adjust them. The process for adjusting the center section or the blade wings is similar for each. Both require you to adjust the front bumper stop which is a wedge of rubber located behind the center section that can tilt the center section either backward or forward. CAUTION! Before beginning this process, don’t forget your safety gear.You should be wearing protective glasses, steel toe boots, and hearing protection if you plan on using an impact gun. STEP #1: Begin by adjusting the bumper stop. To do this, first use a floor jack to support the coupler. The purpose of this is to take the pressure off of the bumper stop so you can adjust it. STEP #2: Loosen the four trip springs. Lower the jack to the floor to release tension on the bumper stop. Now you’re ready to adjust the alignment of your cutting edge. 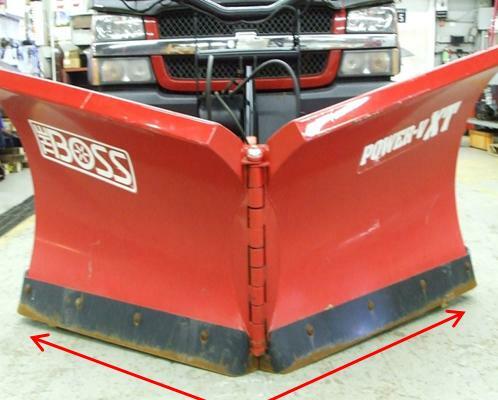 STEP #3: If you are lowering the center section, move the bumper stop forward, one hole at a time, into the center section to bring the front of the plow down until level. If you are lowering the wings, move the bumper stop towards the truck, away from the center section, one hole at a time, to bring the wing tips down until level. STEP #4: Now, tighten up the trip springs. 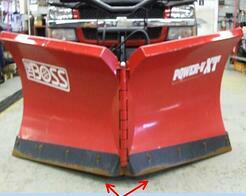 The plow should be level to ground, if not, repeat Step 3 by moving the bumper stop either forward or backward another hole until proper alignment has been obtained. If you have any other questions please contact our Technical Service Department at 800-286-4155 ext. 2 or visit www.bossplow.com/support. Happy plowing!